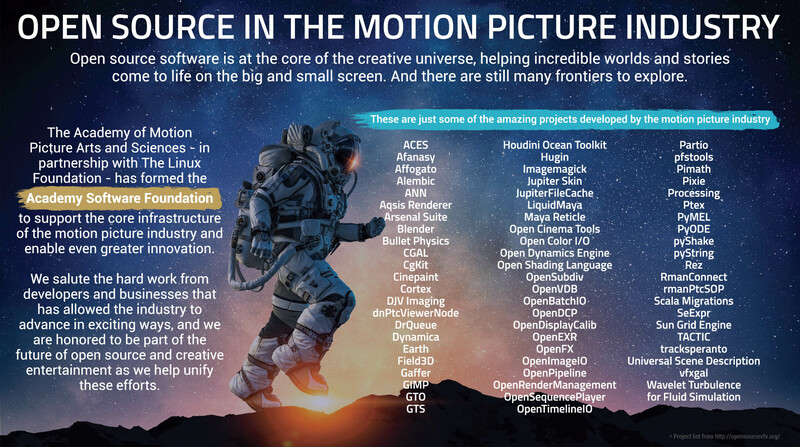 For the first time in history, The Academy of Motion Picture Arts and Sciences and The Linux Foundation have partnered together to launch the Academy Software Foundation (ASWF). We sat down with the Head of ILM, Rob Bredow, to discuss the implications (below). The ASWF is the first time the Academy has lent its name to a third party organisation and it illustrates the importance of this new Foundation. The ASWF is a new nonprofit organization that will provide a neutral forum for open source software developers across the motion picture and broader media industries to share resources and collaborate on technologies for image creation, visual effects, animation and sound. The project started about two years ago, at an Academy Sci-Tech meeting when Rob Bredow was talking with Ray Feeney, who is also a member of the Sci-Tech Awards Committee of the Academy of Motion Pictures Arts & Sciences. The two discussed how the Open Source community had some problems and challenges. They acknowledged it is hard to maintain a healthy open source ecosystem even with so many good natured participants in the industry. Bredow recalls, "we really did have great support, but it wasn't as vibrant as it could be. So we thought, let's look into this and see what we can do?" "Two years ago we convened a group of people who were interested in open source technology from across the industry. We had a series of four different meetings over a couple of years to understand the nature of the problem, make sure we all agreed and to see if the Academy could do anything to help" explained Bredow. "The result is the Academy Software Foundation, where the Academy and the Linux Foundation have partnered to create a level playing field and host an environment for open source software that's not owned by any one company, but is a collective effort of the entire industry". Founded in 2000, The Linux Foundation provides tools, training and events to scale any open source project, which together delivers an economic impact not achievable by any one company. The Linux Foundation allows the world’s top developers and companies to build open ecosystems that accelerate open technology development and industry adoption. Together with the worldwide open source community, it aims to solve the hardest technology problems by creating the largest shared technology investment in history. Rob Bredow uses OpenEXR as an example of something that might move to ASWF. "A good example is, lets imagine that ILM wanted to hand over, OpenEXR to the Academy Software Foundation. First, ILM would take the project, fill out a submission form on the ASWF website and say that ILM would like to pass this over to the ASWF. Next the ASWF would analyse it, and make sure that that it is a good fit. The application would be reviewed to decide about formally bringing it in or not. Part of this is to make sure that they have the right resources to properly support it. Once accepted, it would be brought in to the Foundation formally. It would still be Open Source, but it would now have additional resources surrounding that work". While Open Source can be easily published today with tools such as Github, the new arrangement provides a set of major advantages. At the code level, there is more structure than just Github. While ASWF will use Github, in addition, the new setup means that when a change is submitted, the code is automatically 'built' and any problems flagged. "If the other engineers who are governing or the governance body for the project for OpenEXR agrees that this is a good addition, then it'll be in the next version. It's a very democratic process for getting OpenSource built and it is based on the years of experience that the Linux Foundation has in doing exactly this". At a company level, the ASWF provides simpler licensing, and templates for any new projects. The new setup provides some strong protections against Patent Trolls and 'bad actors'. "There are some smart ways that the Foundation configures itself as a legal entity to minimise the opportunity for a Troll or a bad actor in the market to do any damage to the operation as a whole" Bredow explains. "There is no perfect inoculation from a bad actor in this space for sure, but there are somewhat clever structures in place to try to minimise damage. The Linux Foundation, has a good track record of being able to survive these type of things. Linux is the widest used operating system in the world with a lot of fantastic technology in it and it's endured lots of challenges to it. We're leveraging a lot of those lessons when setting ASWF up"
The software programs remain open. If you are not a paid member of the ASWF, or an engineer in a small company that just has an idea, you are free and open to use and contribute to the software. There is no special use rights assigned to the Foundation financial contributors to the ASWF. The code is still completely Open Source, but now it is easier to use, easier to contribute and safer to incorporate into your professional pipeline. varying governance and licensing models. All of which the ASWF seeks to address in order to ensure a healthy open source ecosystem. What it will mean for Artists? We asked Rob Bredow what all this means to a normal artist working today? "The goal of the Academy Software Foundation is really to increase the quality and the quantity of open source software and the amount of innovation we can put into the tools. These are the tools that artists are using every day. Open Source software is already a really key part of all of our workflows and this should just increase the quality of that software that you are using everyday" he replied. Bredow went on to point out that, "we get the best ideas from artists every day. We hope that the Foundation can really help you have an idea for something that perhaps doesn't yet exist in open source application and you may not know the right forum for that idea... As the Academy Software Foundation gets off the ground and adopts projects, you now have a really clear place to go to to submit your idea, talk directly to the engineers who were engineering these core technologies and see those ideas implemented". At SIGGRAPH 2010, when Rob Bredow was CTO at Sony Imageworks, he and ILM's then CTO Richard Kerris launched Alembic. We asked Bredow what lessons he had learnt from that experience? Rob (3rd from L) and the team launching the Open Source Alembic in 2010 at SIGGRAPH in San Diego. "The greatest thing about that launch was that we had the support from the visual effects vendors in combination with ILM and Sony Imageworks, for real innovation to take place in an open source environment. We were really changing the geometry format for the industry and we were doing it, in that case, before it was even finished. We were going to finish the development in a public repository that everybody could see. And we actually saw tremendous value out of that in that next year, as we finished the development and rolled out the package" Bredow explained. This was the first time that Bredow had experienced doing a development outside the walls of a single company and doing it in public where everyone could see all the project's dirty laundry. "And I walked away from that realising that as we were making it more open, - we were actually getting more value out of it". Alembic had faster adoption, the companies got more value out of their engineering and the project was a worldwide success. "So that was a big encouragement to me to really push harder into open source" he adds. The move is being embraced by traditional VFX companies and manufacturers as well as those such as Epic Games, which is expanding from just gaming into virtual production and wider markets. "Epic Games is committed to providing a new generation of real-time technology for the film and television industry based on standard technology and practices. We are strong supporters of open source software and open platforms, and are thrilled to be part of the new Academy Software Foundation.” commented Marc Petit, General Manager, Unreal Engine Enterprise. When Petit was SVP, at Autodesk Media & Entertainment he was a great supporter of the introduction of Alembic, and is very familiar with the benefits to equipment manufacturers in supporting standards and open source. He believes in leadership with such great areas, which "enables increased levels of collaboration throughout production". While Rob Bredow started the ball rolling, and is the Chair of the investigation from an Academy perspective (from the perspective of the Sci-Tech Council), - early on an Open Source Investigation Committee was formed. David Morin was the project lead for the Academy Open Source Investigation. "David handled all of the work of getting everyone together and making sure that these meetings were well scheduled and we had the right people in the room. He was willing to use his contacts and reach out on behalf of the Academy to help facilitate this" Bredow explains about David Morin's key role. "And he really helped drive this project forward, working out all the logistics to go from an idea to actually getting the right people in the room and being able to make this reality. He was really instrumental in setting that up. He was involved for the whole two years since those first meetings". DreamWorks was the first to announce, as a founding member, that they will propose OpenVDB as the first project to be transferred to the ASWF. ”DreamWorks intends to establish OpenVDB as a project under the ASWF with a mission to continue development and maintenance of this key industry standard for volumetric representation. A technical charter will be established, and an initial technical steering committee selected with representation from the largest current contributors. Meetings and decisions of the steering committee will be recorded and public for transparency", commented Andrew Pearce, DreamWorks VP of Global Technology. “We believe in that cause and are enthused to demonstrate our support of the ASWF with both our membership and moving the award-winning OpenVDB under the ASWF umbrella. It demonstrates our continuing commitment to the health of open source software in our industry, and the Foundation is the framework for future growth of the technology". The ASWF will have a significant presence at SIGGRAPH 2018. Conference attendees can go to the Academy Software Foundation Birds of a Feather (BoF) session on Tuesday, August 14, from 9:00 - 10:00 am PT in the Vancouver Convention Centre, East Building, Room 11. While there may in the future be special conferences focused just on ASWF, for now the aim is to educate artists and developers. "Right now we're just in the early days, there are projects that the Linux foundation manages that have their own conferences that are very substantial in scale. So it's not out of the realm of possibility that we could do something like that in the future. However, right now we're leveraging SIGGRAPH as our primary meet up point because all of the core group of people who have participated in making this happen", explains Bredow. "We're using the Bird of a Feather meeting to kick off and to make sure that we're communicating clearly with people. Whether they are an individual contributor and they just want to write some code or they just want to use the software that is going to be soon hosted by the Academy Software Foundation. This message we want to communicate is that the ASWF can be a single point you can go to as the hub of for open source software for our industry". Interested developers and engineers can learn more about the ASWF by attending Rob Bredow's keynote session on Monday, August 13, from 2:00 - 3:15 pm PT, there is also a keynote livestream on YouTube and Facebook. 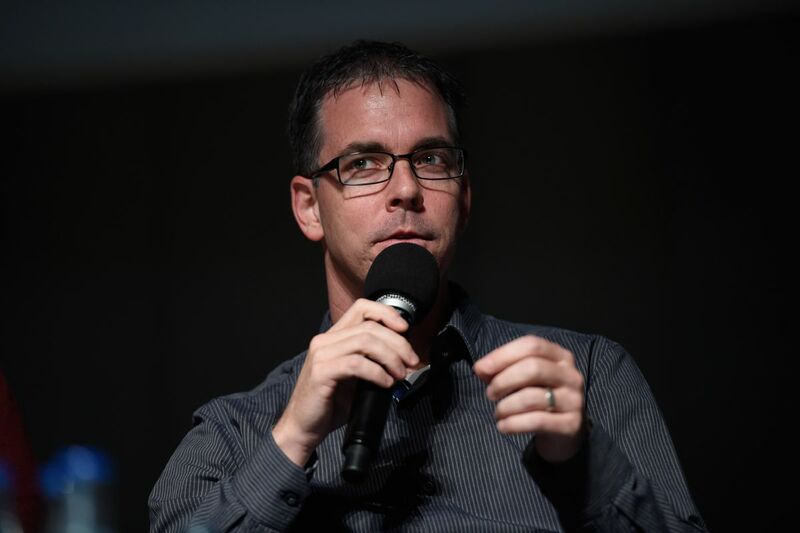 "The more open we can make it easier to allow developers to be a part of building tools that are going to be an instrumental part of filmmaking, the better quality software and the more innovation we're going to have in this space," Rob Bredow comments in closing.